We are now five issues into our love affair with Mr. Biff Tannen. The comic has revealed some inner truths about our unlikable Hill Valley resident/landlord. Biff to the Future still has to follow the rules of what Back to the Future started. 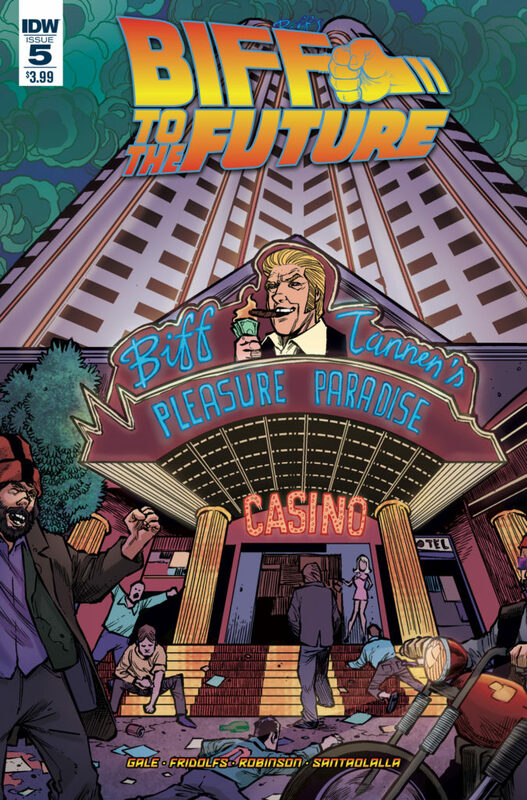 The latest issue gives us some back story about what Doc Brown and company are doing to rid the town of good old Biff. Doc is brilliant as always and he invents something that actually works. They try to use an old trick that doesn’t really pan out all that well due to the lack of information. The whole situation provides more information to explain Biff as a whole. Gale and company continue to tell an excellent tale. This issue focuses more on Doc Brown and how he ends up in this hellish nightmare. I generally enjoy Alan Robinson’s artwork and his exaggerated version of Doc Emmett Brown works really well here. This trip takes us all away to 1983 so our story might come close to an end.